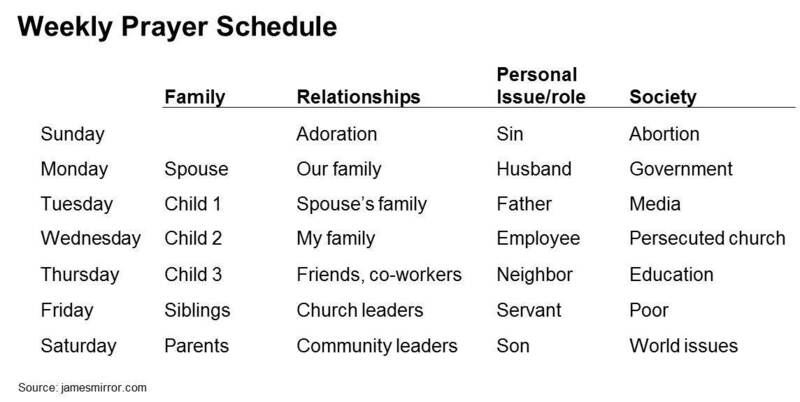 This schedule is heavily focused on requests, but the prayer should start by praising God for who He is, thanking Him for what He’s done and confessing sin. In the schedule, Sunday is focused on adoration of God and confession of sin be humble before God in preparation for the week ahead, but don’t limit those parts of prayer to only one day per week. This entry was posted in Discipleship and tagged how to pray better, how to pray more consistently, prayer framework, weekly prayer plan, what should I pray about. Bookmark the permalink. Hi, I want to subscribe for this blog to obtain latest updates, so where can i do it please help.